Stunning Idaho opals housed in the ever-trendy, classic sterling silver stud setting. If elegant simplicity is what you are looking for, these are the earrings for you! Proudly made in Philipsburg, Montana. Fiery 8x6 Spencer, Idaho opal triplets dangle beneath lovely art-deco style lever-back settings. The sterling silver pair features a secure ear wire to help prevent loss and ensure many years of enjoyment. This classic style can be dressed up or down. Know someone with an October birthday? 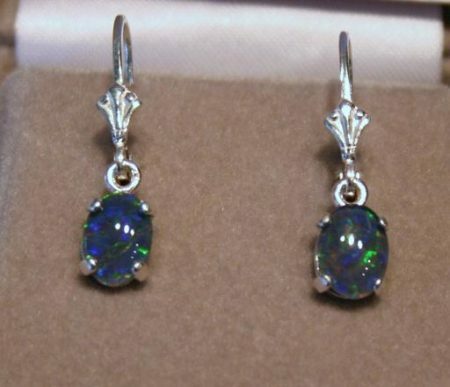 Celebrate with a gift of their opal birthstone. Proudly made in Philipsburg, Montana. .25 tcw brilliant yellow Rock Creek sapphires from Philipsburg, MT. These beautiful sapphires are set in 14K white gold post earrings with a swirl to give them some classy character. egrity of this unique Montana sapphire. Made in Philipsburg, MT. These beautiful Montana sapphire earrings hold 2 pink sapphires weighing .25 tcw. They are then surrounded by crisp white diamonds to really show off that special pink color. Set in 14k white gold, these classy earrings are sure to bring years of enjoyment.